Would you like to start a business from home, but you don't know where to start or what to do? Do you need a dose of inspiration? 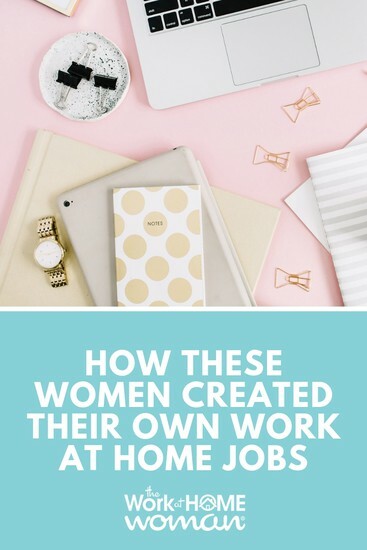 Check out these amazing women’s entrepreneurial success stories on how they got started working from home and pursuing their dreams of self-employment; it will give you the motivation and strength that you need to get started on your own path. Sarah Edwards and her husband, Paul, co-authored the books, Working from Home, Secrets of Self Employment, and Finding Your Perfect Work along with 14 other lifestyle and career change books. Sarah started working from home in 1974 as a Psychotherapist after leaving her full-time position as a Social Services Specialist for the Head Start Program. She learned about working from home in the early 70s when she met with an outside consultant for the Head Start Program; during this meeting, she discovered that her colleague’s office was based in her home, and immediately she thought to herself, “This is for me”! At the time, it was nearly unheard of to work out of your home, but encountered with rarely seeing her husband and her young son during daylight hours, Sarah implemented a plan to become a work-at-home mom and wife. After completing her master’s degree, Sarah quit her full-time job as a Social Services Specialist and opened a Private Psychotherapy Practice in her home. Seeing how much Sarah enjoyed working from home, her husband Paul decided to follow in her footsteps. Paul quit his full-time job as President and CEO of an Environmental Research Firm and started a Consultancy Firm that was based from their home. During this time Sarah and Paul were questioned by numerous people on how, they too could work-from-home, so they decided to write a book about it. Before writing the book, Working at Home, Sarah and her husband had no experience with writing or publishing a book. But with strong perseverance and the help of a great editor they were able to successfully publish their book, which is now in its fifth edition, with over half a million copies in print. Sarah has a Bachelor's Degree in English, a Master’s Degree in Clinical Social Work, and a Ph.D. in Ecopsychology. She currently lives in California in the mountains of Los Padres National Forest with her husband, Paul. Sarah continues her private practice as a sustainable career and economic well-being counselor; she is also the Director of The Middle-Class Advocacy Institute and provides continuing education to helping professionals working with others seeking independent jobs that will sustain them in our changing economy. For artist Melanie Vowles Jerdon, many years of success in the graphic design and marketing field preceded her decision to work-from-home. With the birth of her son Tyler in 2007, came a heartfelt commitment to be there for her child, experiencing daily quality time with him and working at a job she loves. With her former company continuing to contract for her talents on a variety of projects, along with referrals and personal marketing efforts, Melanie now has in her home, the perfect balance between work and family. Melanie serves corporate clientele with logo design, promotional layouts, and web-work, however, she also welcomes projects that allow her illustration and painting talents to come into play. Melanie’s work includes, but is not limited to: illustration, painting, promotional and business collateral, marketing materials, menu design and layouts, corporate identity and branding, logo design, web design, photography, and holiday fun! Having spent most of her life in California (graduating from the University of California, Santa Barbara, with a Bachelor of Arts Degree in Communications and Studio Arts), shortly before her son’s birth, the family relocated to Austin, Texas. Melanie has a wonderful husband, two amazing kids, three awesome step-daughters, and a life she feels is blessed and one she is grateful to be living. Heather Bryan has made a career out of personalization, specializing in golf bag tags, luggage tags, plaques, and keychains. Because of her business' portability, she was able to bring her engraver to events all over the world. However, after getting married and having a child, Heather decided traveling 32 weeks out of the year was no longer for her. She wanted to grow some roots, and find more balance in her life. Back at home, Heather observed an unmet need for personalization and engraving in her small mountain town of Colorado. Word quickly spread about Heather’s ability to engrave luggage tags for events, keychains for realtors, and personalized wedding gifts. But with this new opportunity, Heather realized she would need to reinvent her engraver, as the system she was using had become antiquated. Although Heather was not an inventor or an engineer, she was determined to create something new, but first, she needed a bank loan. But bank after bank turned her down, with one banker telling her, “A woman in technology is not a good investment.” That statement galvanized Heather to become the first woman to develop an engraving system, and furthermore, she was going to help support other women by helping them to start up their own engraving businesses. When her new, user-friendly engraver was ready, Heather launched a business-in-a-box called, Moms Making Five Figures. With this business opportunity, individuals receive an engraver, a supply of items to engrave, an owner’s manual for the engraver, ongoing personal support, and insight on how to run a personalization and engraving businesses. Balance is Heather’s north star. Feeling balanced at the end of the day is her measure of success. She explains, “I need to make sure that my family, my physical and mental health, friendships, and work relationships are all in balance.” Having a home-based business allows that to happen. Heather has seen steady growth and positive reports from her customers and has a goal of helping to 2,000 new woman launch an engraving business by 2025. There are so many ways to start working from home. You can start a business from scratch, you can provide freelance services, or you can join a direct sales, franchise, or business-in-a-box opportunity. Each business has its own set of pros and cons, just do a little research and figure out what path best suits your needs and personality type. What type of business would you like to start at home? Or do you already run a business from home? If so, drop us a note; we'd love to hear from you. If you enjoyed this post — please share it on your favorite social media site. Originally published May 12, 2014. Content updated February 6, 2019. I really need something to do from home. I care for my son with health issues.